As explained earlier, all the pre-poll surveys and the well-attended pre-poll rallies held by the chief minister Siddaramaiah, who himself hails from an AHINDA Kuruba Caste (Shepherd), proved that most of the downtrodden sections of the society (the AHINDA social groups) were happy with the several welfare schemes of the government. These schemes — such as the Annabhagya (7 kgs of free rice per month); Indira Canteen in cities and towns that provided cheap but relatively good food; Ksheera Bhagya, additional amount paid for every litre of milk supplied; among many others —created good will about the government and its chief minister. Apart from this, Karnataka was the only state, after Andhra Pradesh, which passed a legislation for the strict implementation of Special Plan Allocation for Scheduled Castes (SC) and Scheduled Tribes (ST). Apart from these material benefits, Chief Minister Siddaramaiah publicly condemned the caste system, communalism, and superstition. He had the distinction of visiting Chamarajnagar more than 8 times, defying the prevalent superstitious belief that whoever visits the place would lose power. Not only have previous chief ministers not visited this town, even the Prime Minister preferred to address his first election rally on May 1st in Santemarahalli, a small town 16 kilometres away from the district centre Chamarajnagar. A closer look at the results tell another story altogether. Siddaramaiah had contested from two constituencies following feedback that believed he would lose in his home constituency, Chamundeshvari, in Mysore district, which is dominated by Okkaligas but has an equal proportion of AHINDA. Hence, he also contested from another constituency, Badami in North Karnataka. where the Lingayats constitute only 20 percent of the population and the rest are from AHINDA. But in Chamundeshvari, he suffered a major defeat by a margin of over 32000 votes, and in Badami he could only scrape through with a margin of just 1600 votes. Even though the poor Okkaligas and Lingayats, who were also beneficiaries of Bhagyas schemes and were also vocal in their support of the Chief Minister, they gave in to the politics of caste pride and caste identity used by both the Okkaligas leaders of JDS and the Lingayat leaders of BJP. For example, the JDS supremo and ex-Prime Minister HD Deve Gowda issued a front page advertisement in leading Kannada dailies continuously for three days prior to 12 May, making emotional appeals to the people to teach a lesson to Siddaramaiah for his arrogance and insults, which even Okkaliga Congress leaders did not commit. The vote margins of victorious Okkaligas and Lingayats candidates, when compared with Congress party’s candidates, are appalling. Out of the 37 seats won by the JDS, most of which are against the Congress in 24 constituencies, the margin was more than 25000. And in three major constituencies, it was more than 50,000. Likewise, in Mumbai Karnataka where BJP gained 15 more seats, the margin of victory was more than 26,000 in average. This indicates an aggressive and determined backlash of dominant castes against AHINDA politics. 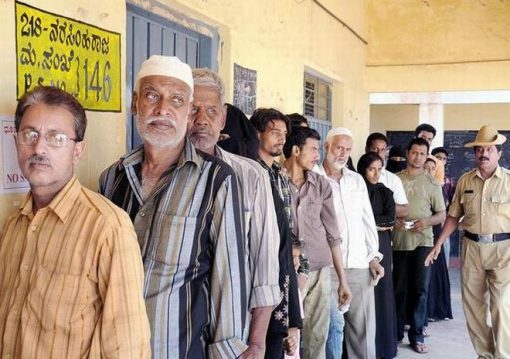 While there were cadres and activists-volunteers, especially from JDS and BJP, campaigning about the necessity of keeping up the caste pride to save themselves from marginalisation by AHINDA politics, there were absolutely no AHINDA volunteers to bring the last mile connectivity with the voters. AHINDA itself is a group of more than 700 castes with many internal rivalries which can be easily manipulated during the time of elections. Thus, welfare politics which do not generate rights-based political consciousness, and which do not have organisational roots with the people, cannot win elections or survive against the reactionary and organised backlash from the dominant castes. Casteist politics, like communal politics, is equally successful in drowning out the material interests of the people. It is also a fact that the Congress as a party is structurally incapable of overcoming these handicaps and hence faces unavoidable debacles. Did the minority tag given to Lingayats backfire? As explained in the earlier section, most of the Lingayats had deserted the Congress and rallied behind the BJP since the 90s. But after Siddaramaiah came to power, he tried to bring them back to the Congress. He passed rules to exhibit the portrait of Basavanna, the founder of Lingayats dharma, in all government offices; he named the Women University in Vijayapura after Akka Mahadevi, a prominent women leader who, along with Basavanna, popularised the new religion. This actually gave a momentum to the long pending demand of the Lingayat community to recognise them as a separate religion. This is unlike the present practice of clubbing them under Hindu-Veerashaiva. Siddaramaiah heeded their demands and constituted an expert committee to look into it. The committee was chaired by retired justice and other experts who gave their recommendation in favour of according the minority religion status to the Lingayats. Siddaramaiah’s government accepted the recommendations and passed on the same to central government. This created a ripple in the Veerashaiva communities and the Lingayats Mutts. Historically speaking, the Lingayat movement took birth in the 12th century by Basavanna. Like Buddhism, the movement began by being opposed to Vedic Hinduism and was against the casteism and patriarchy ingrained in Hinduism. Even though it was co-opted in the Hinduism at the later stages, the demand for the separate identity was made by many influential Lingayat Mutts since the 1980s. One such petition was even signed by Yeddyruppa. Lingayats constitute around 15% of population. The Hindu Veerashaiva community made every effort to oppose these moves. The RSS also opposed the move. Because Yeddyuruppa belonged to the Lingayat community he took an opportunistic stand and kept silent. He, however, allowed other functionaries to oppose the move of the government. The BJP claimed that it was a ploy of the government divide Hindu religion. The veerashaiva seers raised an open call to defeat the Congress. The Lingayats seers gave a full page advertisement, indirectly asking the community to support Congress, but they did not seem to be as active as the Veerashaivas on the ground. Even the Congress cabinet was divided over the issue. Though there was huge mobilisation of Lingayats, sometimes even swelling into lakhs, earlier, this did not translate into votes for the Congress party. In fact, it seems to have gone against the Congress. The BJP, in its election campaign, had called this move by the Congress as a ploy to prevent Yeddyurappa, a Lingayat, from being the CM. Such false campaigning by BJP seems to have worked. The party successfully bagged some sympathy votes. Three Lingayat ministers who spearheaded the separate Lingayat movement have suffered terrible defeats against the BJP. Out of 62 seats where the Lingayats are dominant, Congress has lost 41 seats and BJP has gained more votes in most of them. In hindsight, two things are becoming clear. Most of the Lingayats living in the villages are not enlightened about the necessity of the minority status or the egalitarian difference between Veerashiavas and Lingayats religions. Most of them are easy prey for the BJP who claimed that the Siddaramaiah’s government is dividing the religion and it was their duty to protect it. And, on the other hand, the enlightened seers or the Basava dharama activists did not take the responsibility of explaining it to them. Social reform at the top without a consolidated social base is incapable of defeating the reaction from below. This is an important lesson to be learnt from these results. A closer look at the pattern of results in reserved constituencies suggests that those in the “Left” among the dalits, who were demanding internal reservation within the dalit community, might have voted against the Congress. The Congress government had constituted Justice Sadashiva Committee in 2005 to look into the matter which gave its report in support of reclassification in 2012 to the then BJP government. But there was a stiff opposition from the “right” communities and also from other touchable castes clubbed under SC category against reclassification. The community accused the Congress, which came to power in 2013, of not acting on the recommendations in its tenure. The Congress government tried to forge a consensus but there was a rebellion within the Congress party from “right-wing” dalits. Hence, the government postponed its decision on the issue. The Left dalits accused the Congress for being quick to act on the demand for minority status by an upper caste (Lingayats), but being negligent about the demands of the dalits for decades. The dalit community gave full page advertisement in many leading Kannada newspapers prior to the election calling upon the community voters to defeat Congress where ever they can. An analysis of the results shows that at least four Congress Candidates from the dalit community were defeated due to this move. In fact, in many constituencies, the wrath of the community has been one of the primary factors that played a role in Congress’ defeat. This is one of the reasons why the margins of victory of Congress candidates, including that of Chief Minister Siddharamaiah in Badami, have come down. Shivsundar is an activist and a long time associate of Gauri Lankesh Patrike.